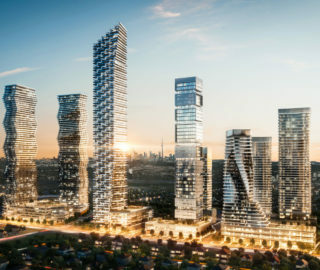 In Canada’s largest city, a 20-year wave of high-rise development continues to crest, bringing an enormous influx of density to Toronto’s downtown. Befitting the city’s nascent global swagger, many of the world’s most acclaimed architects – from Renzo Piano and Jeanne Gang to Diller Scofidio + Renfro and Snøhetta – are taking a hand in shaping the city’s future. As Toronto’s architectural horizons expand, four Danish studios bring a distinct design philosophy to the evolving metropolis. While 3XN, COBE, Bjarke Ingels Group (BIG), and Henning Larsen Architects all have strong individual qualities, they share a commitment to material excellence and aesthetic clarity that makes the small Scandinavian country a leader on the global design stage. On March 4, Crown Prince Frederik of Denmark was in Toronto to unveil an exhibition of Copenhagen-based 3XN’s waterfront architecture. It was an auspicious occasion, coinciding with the design reveal of 3XN’s latest competition-winning project for the Toronto waterfront. 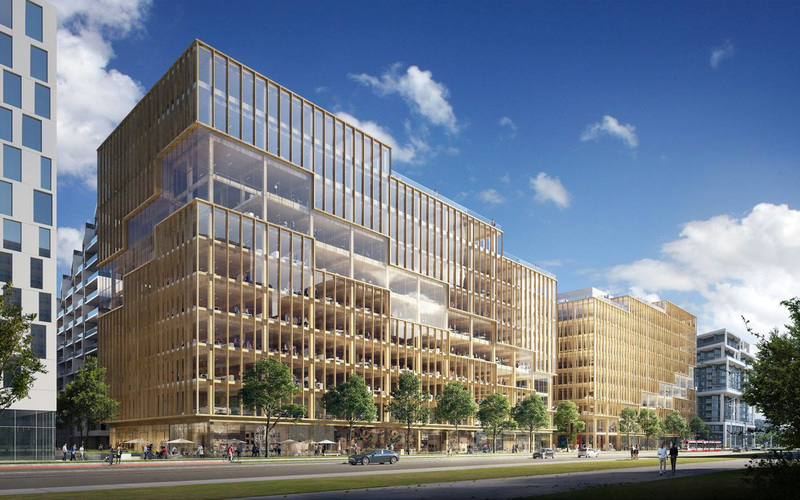 Known as T3 Bayside, the newly announced development is currently the tallest mass-timber office project planned in North America. Consisting of two 10-storey buildings, T3 Bayside is set to be constructed with an eye to adaptation, allowing for disassembly or expansion of the buildings as needs change. The use of wood also makes the buildings significantly less carbon-intensive than their concrete counterparts, while imbuing the interiors with a (very ‘hygge’) sense of warmth. Across the facades, the natural wood hues are complemented by a cladding system that introduces an organic tone across the varied – though highly legible – building envelopes. 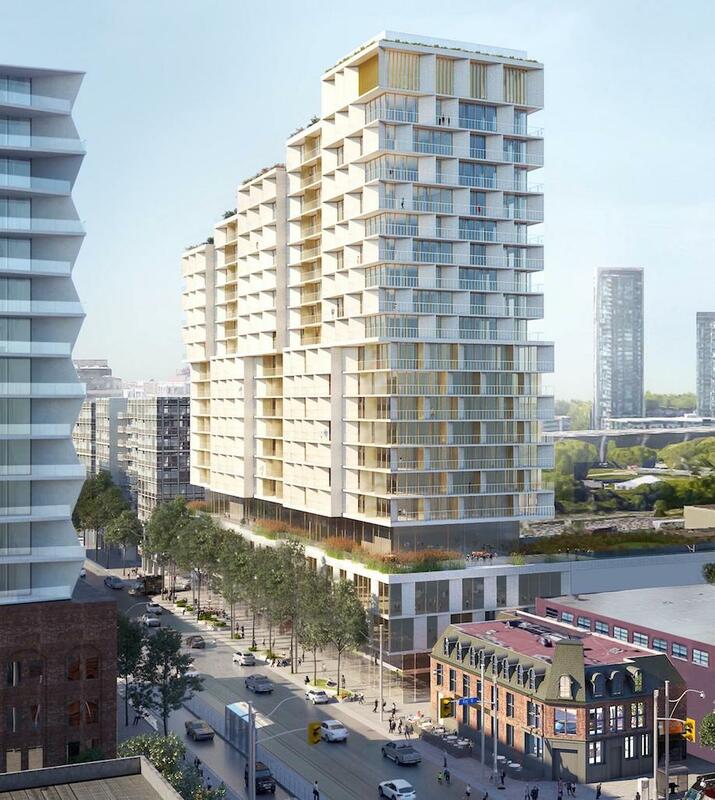 Remarkably, T3 Bayside already represents 3XN’s fifth Toronto project. 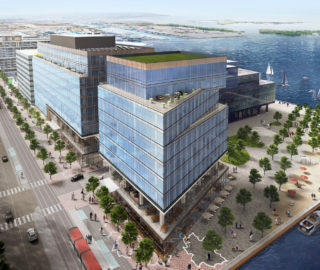 The firm – which was founded in Aarhus in 1986 – is quickly making its mark on the Bayside community, where the residential Aquabella and Aqualuna buildings are now under construction. 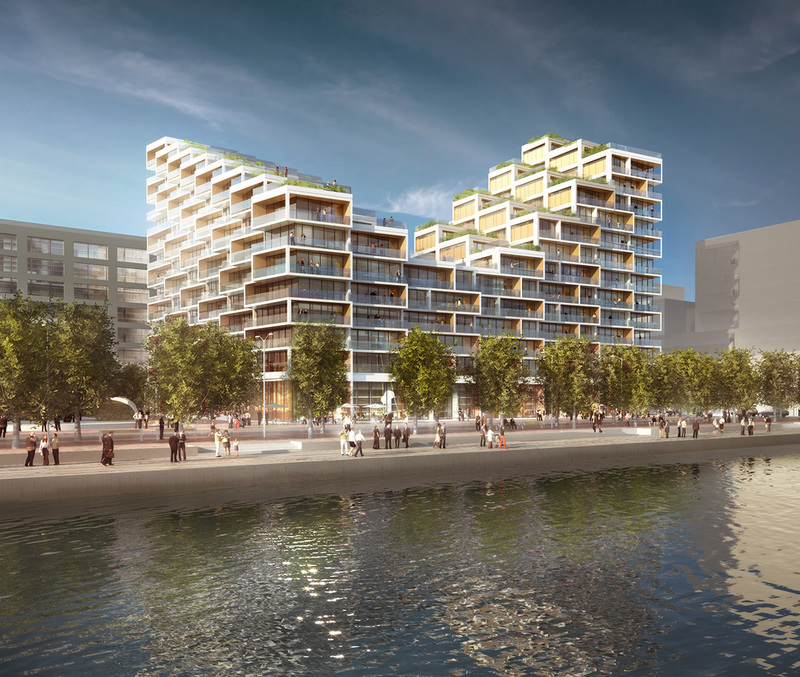 The neighbouring waterfront projects are designed to maximize outdoor space and lakeside views, with massing strategies that break up individual upper-level suites into smaller volumes. Accommodating spacious terraces, the staggered configurations maintain an impressively cohesive relationship with the rectilinear lower volumes of both buildings, a feat accomplished through the consistent repetition of patterns. At Aquabella, crisp white cladding frames individual units, establishing a visual pattern that carries across the body of the building. At Aqualuna, the balcony wave patterns create a similar sense of aesthetic unity, establishing a clear (and eye-catching) identity. 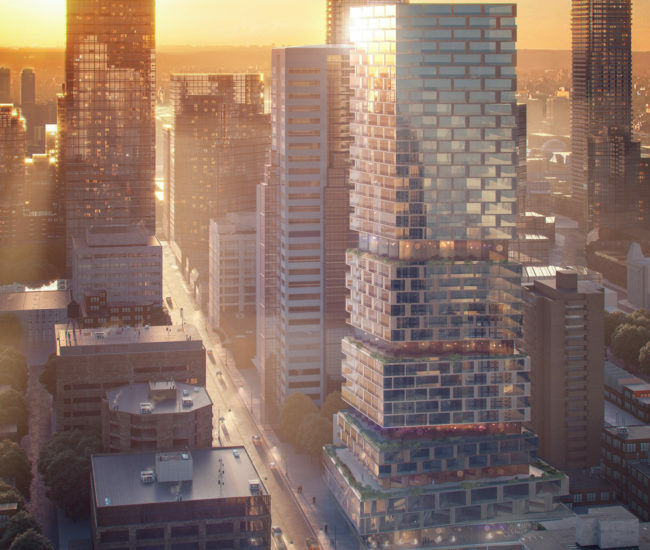 At the storied corner of Church and Wellesley, 3XN’s proposed 39-storey residential point tower introduces a substantial new public space in its podium. Open to the elements in good weather, the flexible space – developed following extensive public consultations – anchors the terraced tower above. Rising in a series of angular volumes, the project introduces a note of variety into a Toronto development landscape dominated by highly rectilinear point towers. Similarly, a varied cladding system – combining glazed elements with prominent balcony panels – offers a welcome visual alternative to the window-wall and back-painted spandrel building envelopes that still characterize most of Toronto’s new-build residential towers. 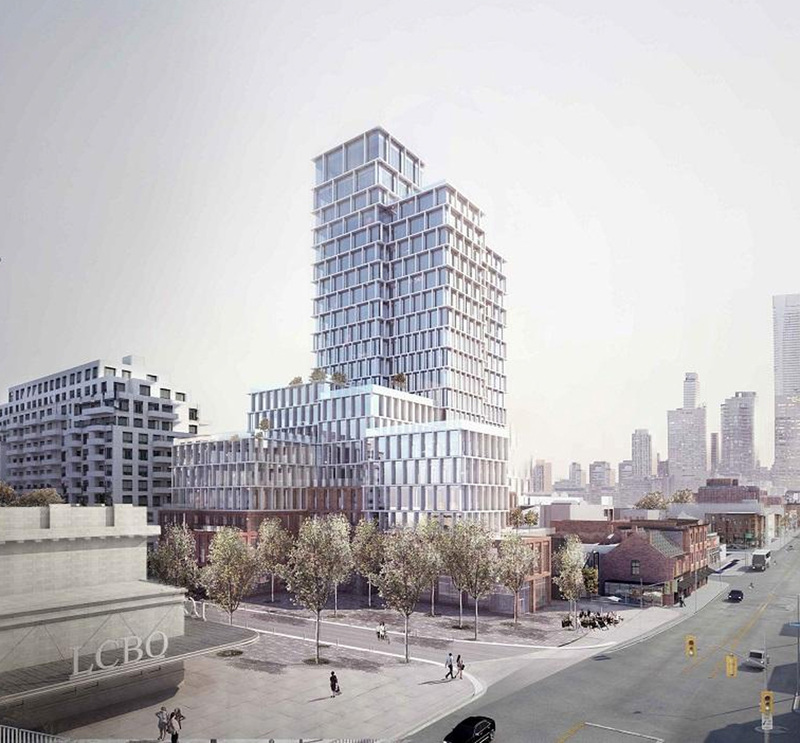 On the west side of downtown Toronto, 3XN is poised to transform a long Bathurst Street parcel with high-rise density. 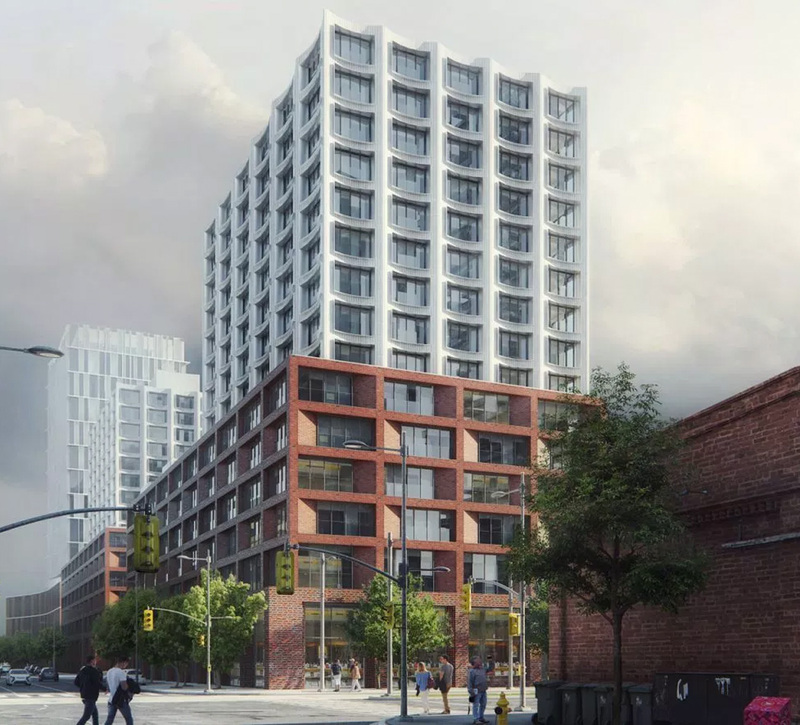 If built, the block-long tower at 64-86 Bathurst would be among Toronto’s very few 21st-century slab towers. Here, an angled balcony pattern attempts to break up the tower’s imposing footprint and an alternating facade treatment also aims to lessen the building’s visual impact by suggesting the presence of discrete volumes. Founded by Henning Larsen in 1959, the eponymous Copenhagen firm is now well-known for its global portfolio of cultural and educational projects. 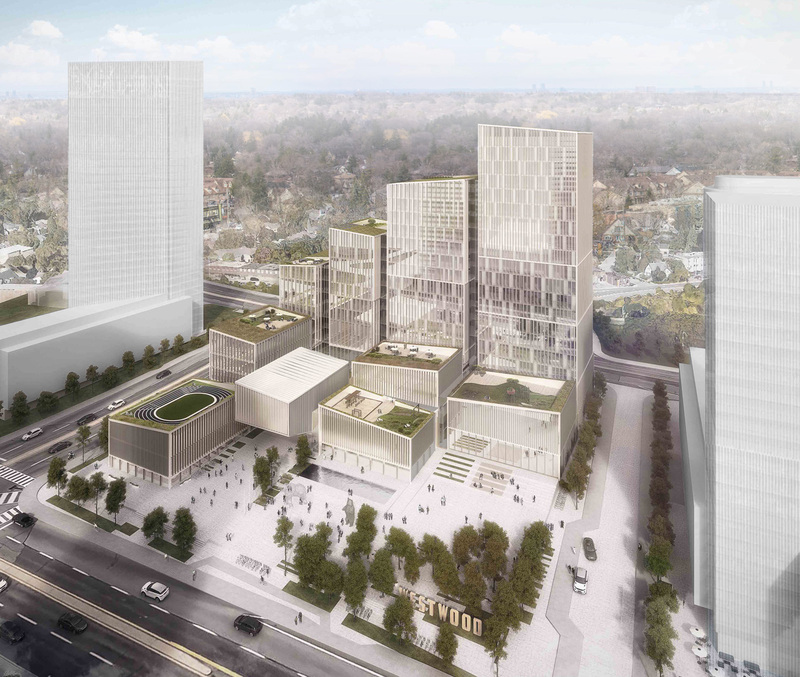 In Toronto, the new Etobicoke Civic Centre promises to combine cultural and educational elements with robust civic programming. 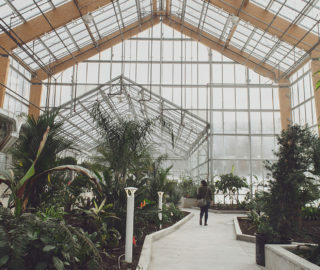 Henning Larsen was announced as the winner of an international design competition to design the facility in 2017, in partnership with Toronto’s Adamson Associates and PMA Landscape Architects. 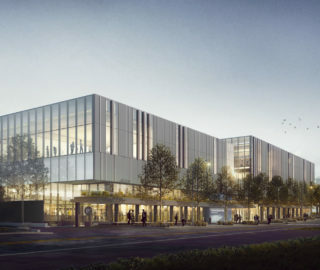 Introducing a series of angled volumes organized around a central plaza, the design incorporates a community recreation centre, a public library branch, a child care centre, and a civic function hall into an office complex. A subtle push-pull between the volumes fosters a kinetic energy, enlivening what might have been a dull municipal office development. The quietly playful angularity also negotiates a smooth transition from the towers to the street level, lending the expansive project a (characteristically Danish) sense of architectural unity. Henning Larsen is also participating in developer First Gulf’s plans for the ambitious East Harbour project. 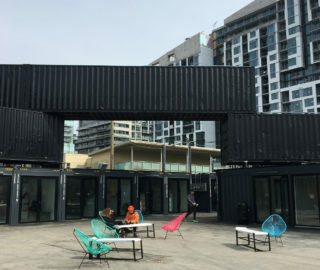 Targeting the redevelopment of the massive Lever Brothers industrial site east of downtown Toronto, the project aims to introduce 50,000 jobs to the site, supported by a mixed-use shopping and entertainment district. 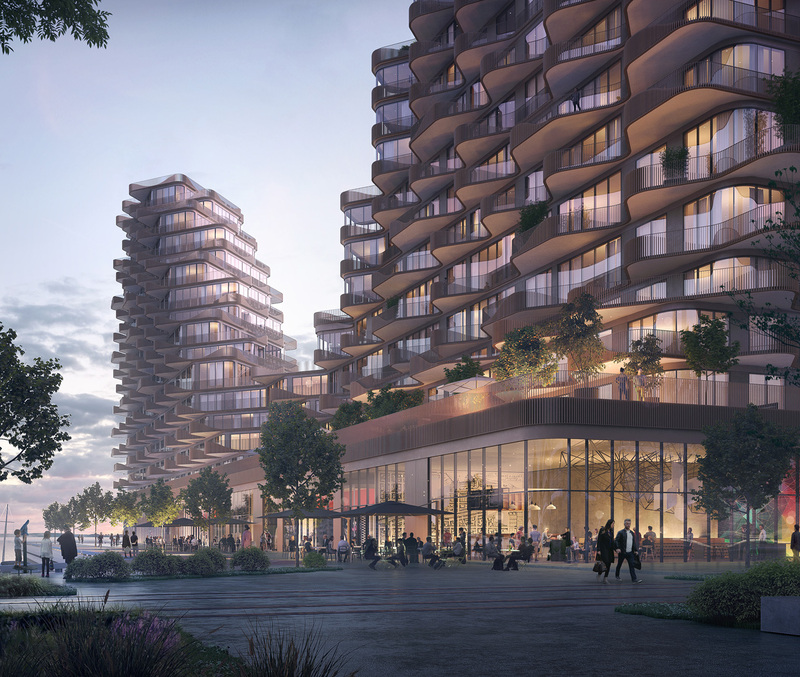 The Danish firm’s role in the project as an “ideas generator” will help to guide the early stages of public realm development for the master-planned site. In 2017, COBE Architects was announced as the design firm for a mixed-use development in Toronto’s upscale Summerhill community. 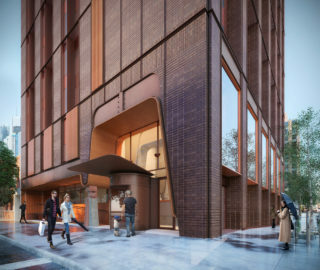 Now marketed as The James at Scrivener Square, the project features a 21-storey residential tower rising from a series of carefully articulated brick-clad podium structures. 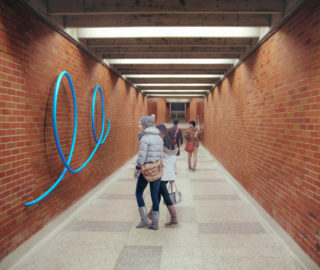 The project’s footprint takes on a slightly irregular site to accommodate surrounding heritage buildings, while incorporating a network of pedestrian gallerias at street level and a retail program housed in the attractively textured brick base buildings. The articulated brick frontages bely the bulky footprint and deftly reference the scale and texture of surrounding heritage architecture; in fact, the project reads as a natural evolution of the existing urban fabric. Clad in a clean pattern of deep-punched windows, the tower above is also broken up into smaller volumes, translating Yonge Street’s fine-grained urban rhythm to a high-rise typology. 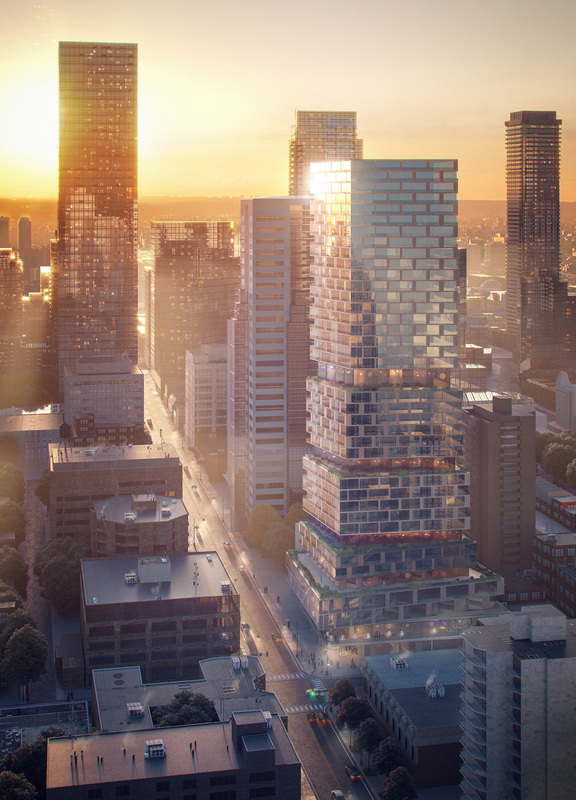 With The James at Scrivener Square continuing to progress through Toronto’s planning process, COBE’s second Toronto project was announced in late 2018. Filling out the vacant “Block 8” strip of the quickly growing West Don Lands, the Block 8 development is being designed in partnership with Toronto’s architectsAlliance. Light tower volumes top a trio of brick-clad podium structures. Like The James at Scrivener Square, the design evinces COBE’S finely developed sense of depth, texture and urban grain. 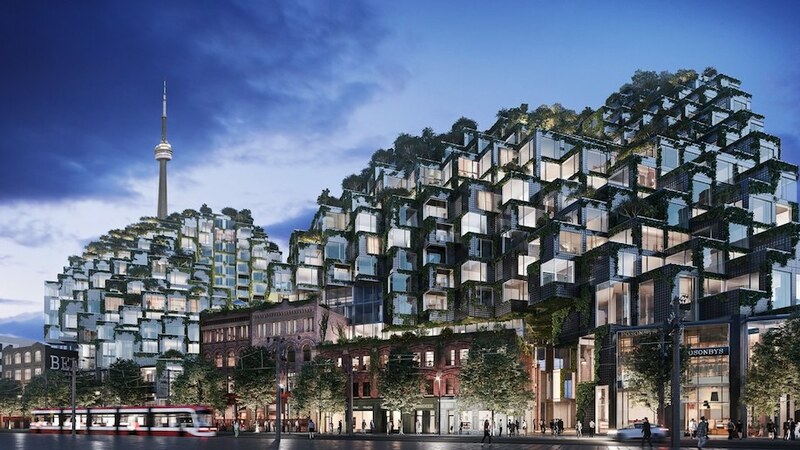 Half a century after the completion of Moshe Safdie’s Habitat 67, Bjarke Ingels Group (BIG) has offered a Toronto analogue to the Montreal landmark. While the Danish starchitect cites Safdie’s project as an inspiration, the urban context is very different. 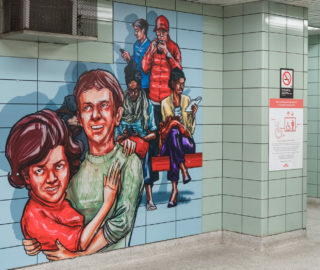 Located on a vibrant, historic stretch and organized around an inner courtyard, KING Toronto introduces new density over and around the city’s existing urban fabric. In effect, Ingels reimagines the urban realm as a human-made mountain. Set to be entirely clad in glass block, KING Toronto combines its formal daring with material innovation. 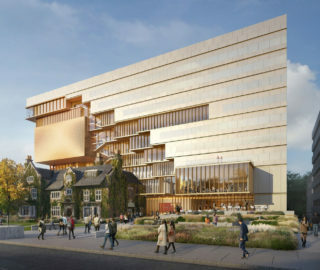 While the project’s first iteration was strongly criticized for its lack of deference to the site’s heritage buildings, the updated design is set further back from the site’s existing built form, with the green-scaped mountain appearing to grow out of the old city. Nonetheless, the BIG design tips the scales from contextual restraint to iconic ambition, while maintaining the material quality and formal cohesion that defines much of the best Danish architecture.